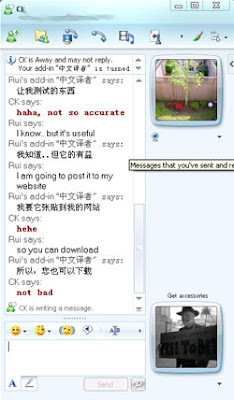 Windows Live Messenger Translator allows you translate your buddy's IM text into your native language. You just type in your message text as normal, and Windows Live Messenger Translator does the translation. The translated text is automatically sent to you and your buddy. * Translate between English, Arabic, Bulgarian, Chinese, Croatian, Czech, Danish, Dutch, Finnish, French, German, Greek, Italian, Japanese, Korean, Norwegian, Polish, Portuguese, Romanian, Russian, Spanish, Swedish. * Instant translations as you type in your instance messages. * Translate both incoming and outgoing IM text. * Translation is done via Google Translation service. * Windows XP (SP2), or Windows Vista. * Windows Live Messenger installed.